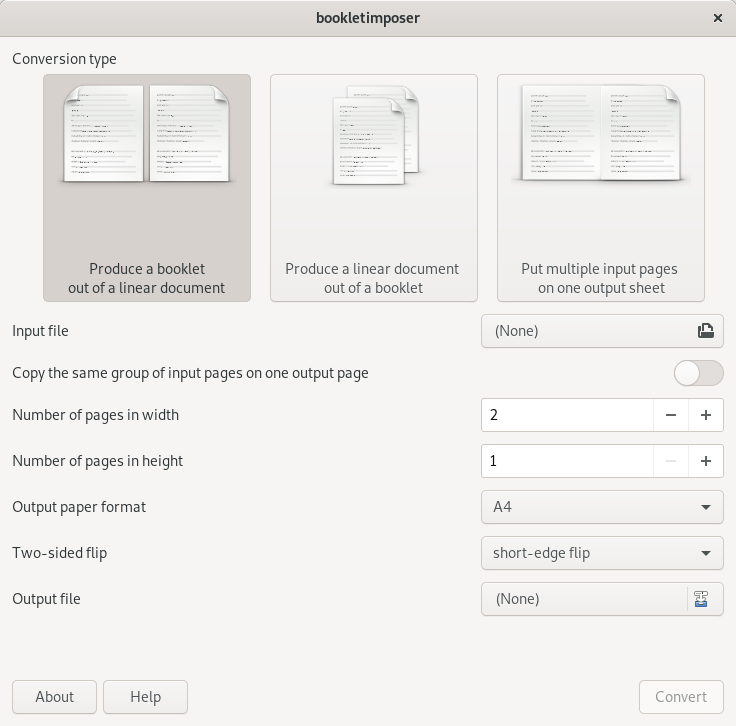 Bookletimposer is an utility to achieve some basic imposition on PDF documents, especially designed to work on booklets. Bookletimposer is implemented as a commandline and GTK+ interface to pdfimposer, a reusable python module built on top of pyPdf2. It was tested on GNU/Linux althought it may work on any systems with a Python interpreter. Bookletimposer and pdfimposer are both free software released under the GNU General Public License, either version 3 or (at your option) any later version. reduce a document to put many pages on every sheet. BookletImposer isn't able to merge multiple PDF files. We advise you to use pdfshuffler if you need such a feature; pdfshuffler is available in Debian. Please read the changelog to know more about latest releases and throw an eye on the git repository te see what's going on. BookletImposer is under development and is thus not perfect yet. Some things work, some others do not... Thanks to report bugs if you find some! Furthermore some features still need to be implemented. BookletImposer is available in Debian. Everything is in the archive. Help on graphical utility in available in the Bookletimposer manual. Help on command line options is available in the man page. Please clone the git repository and submit patches to kjo@a4nancy.net.eu.org. pdfimposer and BookletImposer are a rewrite of PyPdfConv. PyPdfConf is not supported anymore, but can still be downloaded here.